Crowds at WDW are a big deal. They can be downright annoying. 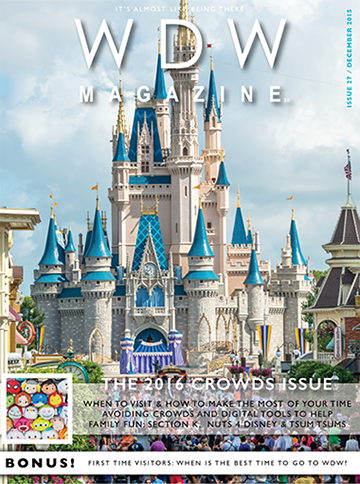 Check out this month’s issue where we give you the scoop on all you need to know about Walt Disney World Crowds. Like I said, it’s a big deal, so we have a really big issue to cover everything. We kick off the issue with our Features Section where some of the biggest names in Disney Crowd tracking talk about 2016 and do a month by month look at the what will be happening. Then we talk about the top 10 ways to use WDW crowds to your advantage and look at the digital tools available to avoid the crowds in the parks. In our Helping Hands Section Dave talks about the best time for a first trip to WDW. Next we have a list of what NOT to bring to the parks, we look at service animals and the services Disney provides for them. We look at whether to Splurge on the special Fireworks parties or to be a Scrooge and save a few bucks. Finally our Photography Team talks about dealing with crowds while taking photos. In the Best of WDW this month we feature MuppetVision 3D, Saratoga Springs Resort, The Boathouse and Island Mercantile. Wow. Great lineup. It just keeps getting better and better. This month in Section k! our buddy Wally D. Wilkerson is back telling some Christmas tales in Nuts 4 Disney. Lisa shows us how to make a pin display that’s kid-friendly. In our downloads section, we have a Word Search, a CrossWord puzzle, a coloring page and some fun in line games including a Magic Kingdom Scavenger Hunt. Emily Rose tells us about Cinderella Castle in our ABC’s of Disney Video. Last month we did several polls on our Facebook page about crowds at WDW. We’ve taken the answers and put them into a cool graphic. Have you ever wanted to be the “First Family” at the Magic Kingdom? Karyn tells us about her families experience when they were chosen. Ryan talks about how he loves the Storytelling of WDW that’s done through sound. In our Meet the Team article we introduce Lynn Svenson and Matthew Cooper. Oh, there’s lots more, Jessi shows us how to make Chocolate Chip Pecan Pie from a Cooking With Mickey Cookbook, we start a new Movie Review feature with A Christmas Carol, and we have both a Vinylmation and Tsum Tsum Corner this month. To wrap up the FanZone, Kathleen wrote a great WDW version of The Night Before “Disney”. This months interview is with Jeffrey Barnes who’s written a book called The Wisdom of Walt. This is cool. In the interview Jeffrey tells us about his college course he teaches about Disneyland that includes regular trips to the park. Where can I enroll? Our final section is our Around the World section. Wow is it full. It starts out with The News from around WDW, followed by a Little Things column about great places to take photos. Terri talks about Fun Facts about Crowds at WDW and we have a Throwdown between Expedition Everest and The Matterhorn. 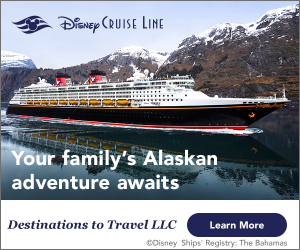 We round out the issue with a look at some December Disney history and an article about when to book a Disney Cruise.